A 16-year-old boy has been arrested on suspicion of murder after a teenager was stabbed to death in Birmingham. 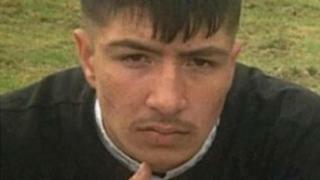 Hazrat Umar, 18, was found fatally injured in Norwood Road in Bordesley Green at about 14:00 GMT on Monday. He died at the scene. West Midlands Police said a 16-year-old boy, from Birmingham, was arrested on Monday night and remains in custody. The force said officers were supporting the victim's family and a post-mortem examination was due to take place. Officers are using special stop and search powers - where they believe there is a risk of violence or weapons are being carried - in Bordesley Green as well as the city centre and Small Heath, until 04:00 GMT on Wednesday. The family of Mr Umar, a South and City College Birmingham student, who lived in Bordesley Green, said they were in shock. Uncle Akbar Afzal said: "He was a very pleasant lad and it is really shocking what has happened. "Not just for himself, but there are other young lads getting stabbed for no apparent reason whatsoever and they are educated lads as well. "I don't understand what is happening." Teenagers Abdullah Muhammad and Sidali Mohamed have also been stabbed to death in Birmingham this month. Mr Umar was a relative of former chief prosecutor for North West England Nazir Afzal. "I don't want any other family having to experience what our family has," Mr Afzal said. "Therefore it requires action, and one of the things that has struck me is how little conversation there is about the subject. "When it was happening in London it was non-stop news and attacks on Sadiq Khan and the police, but none of that seems to be happening in Birmingham." South and City College Birmingham principal, Mike Hopkins, said he was "extremely shocked and saddened" over the death of the electrical engineering student. "He will be extremely missed by staff and students alike," he said. "We are doing all we can to support those struggling with grief." Shabana Mahmood, MP for the area, has requested an urgent meeting with the West Midlands' chief constable and the police and crime commissioner. She said: "Our communities need assurances that measures are being put in place to work with local communities to prevent any further appalling incidents from happening. "The rising violent crime, and particularly knife crime, we have seen in recent weeks and months across Birmingham is extremely concerning."